His Majesty The King granted Dhar to appoint Bhutan’s Ambassador to Kuwait. His Majesty also appointed Zimpon Wogmas to the Office of the Gyalpoi Zimpon. A press release from the Royal Office of Media said the new ambassador to Kuwait is Tshering Gyaltshen Penjor, who was previously serving as the deputy permanent representative at the Permanent Mission of Bhutan to the United Nations, in New York. The two new Zimpon Wogmas are Karma Tenzin, who was working with the Ministry of Agriculture and Forests, and Yonten Phuntsho, who was heading the Kidu Support Service of the Office of the Gyalpoi Zimpon. Zimpon Wogmas support the Gyalpoi Zimpon in delivering His Majesty’s various Kidu to the people. The Zimpon Wogmas, on deputation from different agencies, come from a variety of backgrounds. 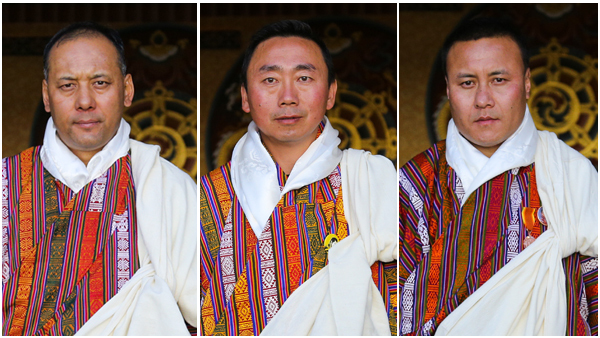 In accordance with Article 2.19 of the Constitution of the Kingdom of Bhutan, His Majesty The King appoints Ambassadors on the recommendation of the Prime Minister who obtains nominations from the Royal Civil Service Commission.